If you created test data during the 30 day trial period, it’s a good idea to delete that data before you start setting up Current RMS for your business. Use Erase Data in System Setup to do this. You can choose which types of data you want to delete – great if you’ve created some legitimate data and only need to delete some records. When you use some types of data in Current RMS, you create links between them. For example, when you add products to opportunities and invoices, links are created between them for historic revenue reporting. When records are linked, you can’t delete them unless you delete all linked records. In the case above, you can’t delete all of your products if you’ve added them to opportunities – you’ll need to delete both the products and the opportunities. Head to System Setup > Erase data. On the next screen, you’ll see a list of all of the types of data you can delete. 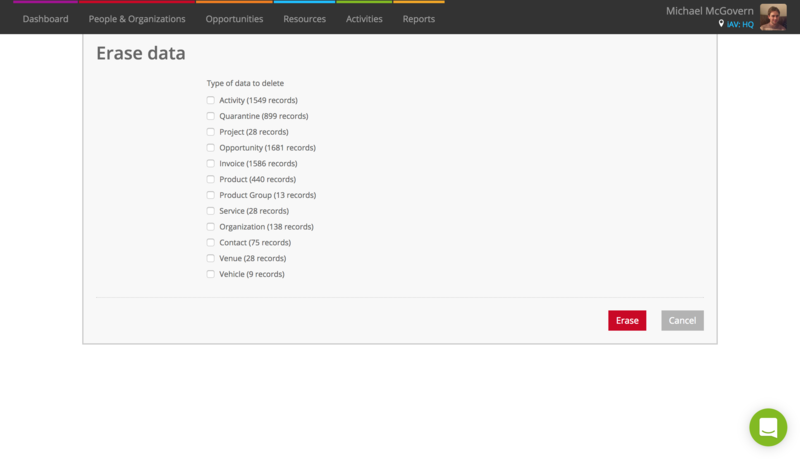 Tick the boxes for the types of data that you wish to delete and click the red Erase button. Enter your password to confirm. ⚠️ This process is not reversible. It will permanently erase all data from the selected modules.